It all started simply enough; my dearest friend gently but persistently encouraged me to pursue the childhood goal of becoming a writer. That was in 1990. So, after a southern Arizona back roads adventure led to the discovery of a time capsule wrecking yard that had survived the scrap drives during WWII in an obscure desert town down along the Mexican border, I decided to give writing a try. First, I scrounged up an Underwood typewriter that was probably as old as the newest car in the wrecking yard, and had the photos from the trip developed. Next, I contacted the managing editor at one of the most prestigious automotive publications (no homework, no query letter or introduction)and sold my first feature about Myloe’s Marvelous Mechanical Menagerie. From those humble beginnings grounded in ignorance and fueled with a passion to share stories of obscure history and grand adventures, my career as writer commenced. That was fourteen books, several hundred feature articles, and countless adventures ago. Hard lessons were learned along the way, sometimes more than once. One of these was that an author spends very little time writing. In fact, if the author intends to eat on a regular basis, very little time is spent in the office. Additional lessons learned included the need to develop the skills of a hostage negotiator, to memorize the phone number for suicide prevention, to learn the nuances of marketing worthy of a presidential candidate, to find time to devote to the studies of a never ending technological learning curve, to never loose the ability to find wonder everywhere, and to develop a very thick hide. Learning to thrive on rejection also helped. Recently I added presentations to my resume. Of course this meant that I had to learn how to create and deliver the presentations, and how to market the presentations that were needed for the marketing of books written as well as to increase the exposure needed to obtain contracts for the writing of books. As a package, all of this has led to some rather extraordinary adventures, and internationally embarrassing incidents. In short, it has been an odyssey worthy of Jason in his quest for the golden fleece. 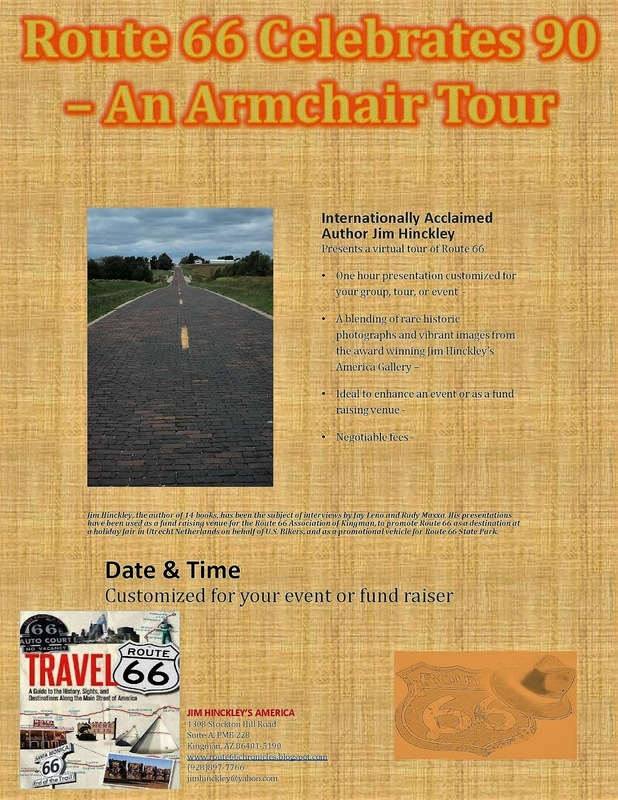 This year I kicked off a series of presentations entitled An Armchair Tour of Route 66. At this time the schedule calls for making this presentation at the Route 66 festival in Holbrook on June 10, and at the European Route 66 Festival in July. However, not surprisingly, it is two other presentations with rather catchy titles that will most likely keep me quite busy this year; Ghost Towns of Route 66, and the one garnering the most attention, Murder, Mayhem, Disasters, and Celebrities on Route 66. Both of these are based on books written, Ghost Towns of Route 66, and The Illustrated Route 66 Historic Atlas. Needless to say, these titles will be available for sale at the presentations. This year Route 66 celebrates 90 years as the Main Street of America. This year marks 26 years since the quest to become a writer when I grow up commenced.